The brothers Richard M. and Robert B. Sherman are mainly known for their work for Disney, that includes MARY POPPINS and BEDKNOBS AND BROOMSTICKS, but for me their best work was the score they wrote for this 1976 British movie. The first time I saw this new adaptation of the famous Cinderella tale was back in 1977 (I was 13 years old). I was instantly conquered by its charms and by its melodious score. One song in particular sent me to heaven and stayed forever in my mind – “Suddenly It Happens”. For me, it’s the best Cinderella song ever written and it’s one of my all time favorite songs. But that’s more to enjoy, a lot more. A solid group of British actors, not famous for their singing talent, have a ball as the members of the court and give us the funny “What Has Love Got To Do With Getting Married?” and “Protocoligorically Correct”; among that group of actors there’s dancer Christopher Gable, who leads the cast into the big production number “Position and Positioning”. As the Fairy Godmother, Annette Crosbie couldn’t be sweeter and it’s she who introduces the magical “Suddenly It Happens”. 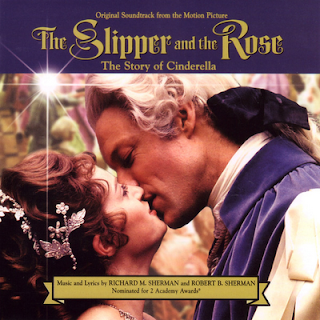 As the Prince, Richard Chamberlain is truly charming and reveals a nice singing voice with “Why Can’t I Be Two People?” and perfectly duets with his Cinderella in the romantic ballad “Secret Kingdom” and in the beautiful waltz “He Danced With Me / She Danced With Me”. As Cinderella, Gemma Craven couldn’t be better; she makes her way to our heart with “Once I Was Loved” and breaks it with the sad “Tell Him Anything (But Not That I Love Him)” and “I Can’t Forget the Melody”. But she’s at her best with the terrific “Suddenly It Happens”. I don’t know if the movie was a big box-office hit, but the Sherman Brothers got two Oscar nominations for their work: Best Original Song Score and Its Adaptation and Best Original Song (He Danced With Me / She Danced With Me). They should have won both. Anyway, although this musical was later adapted to the stage, this original movie soundtrack is the only recording of the score available and I strongly recommend it. It’s magic, melodious, charming, uplifting and deserves to be discovered!